Last week, I published the first of part of this two-part series on the utility of women’s sports programs in college. In part I, I reached the conclusion that, for the institutions, the value in women’s sports, in the form of institutional morale, diversity and scholarship, significantly outweighed the financial costs necessary to fund those programs. Therefore maintaining those programs was worth it. As I mentioned, however, the institutions are only half of the equation. In order for women’s college sports to be a viable endeavor, the athletes themselves must also decide that playing sports in college, as opposed to skipping college in pursuit of professional sports careers, is worth the sacrifice of their time, energies, and money. In part II, I examine the utility of college sports form the standpoint of the female athlete. From the start, I should establish that not all athletes are created equally. That, of course, is no secret, but I thought it important to state so that it’s fresh in your mind as you read this article. Not all athletes have the same skill level, personalities or opportunities. What works for one girl may not work for another; what one girl needs, another may not. Keep that in mind as you read on. Let’s be honest, women’s sports have yet to develop to the level that men’s sports have; therefore, the number of viable professional outlets is smaller for women, assuming that the athlete desires to live a comfortable life as a professional athlete. (If that’s not her goal, then the pickings suddenly become less slim.) The type of sport an athlete plays can play a major role in determining whether she should pursue that sport in college. Generally, female athletes who participate in individual sports (i.e. tennis, golf, track and field) tend to earn more than athletes who participate in team sports (i.e. basketball, soccer and softball). Of the athletes on Forbes’s 2013 World’s Highest Paid Female Athletes, all of them played individual sports. The athletes, all millionaires, play tennis or golf or they skate or drive race cars. While I am sure that if the list was broader than the top ten (say the top 50) some athletes who play team sports would be included, it is apparent that athletes who play individual sports have a higher earning potential than those in team sports. As I revealed in the article “The Curious Case of NCAA Violations,” female WNBA players’ salaries (which do not take into account any money earned in international leagues) max out at $105,000. Earlier this year, the newly formed National Women’s Soccer League announced that player’s salaries would range from $6,000 to $30,000—that’s per five-month season, not per game or per month1. The majority of players in either sport won’t get anywhere near those maximum salaries. Those salaries, dictated by salary caps and limits that do not exist for women in individual sports, make it very difficult for women to play their sports professionally full-time, if at all. If most women get a college degree to help them increase/maximize their earning potential, athletes in team sports may need to consider playing their sport in college so that they can train and compete for free while securing a degree that they can use professionally in the event that their respective sports careers do not provide adequate revenue. For those athletes who play individual sports; however, college may delay lucrative careers and prevent them from establishing rigorous training programs that will improve their skills and ability to compete. A glance at the Women’s Tennis Association (WTA) shows that not one of the top 10 players went to college before declaring themselves professional tennis players. For many years it has been commonplace for young tennis players of exceptional talent to forgo traditional elementary, middle and high schools to enroll in special tennis academies that educate the athletes while providing world-class training and the ability to play competitively without the hindrance of traditional school schedules. Following these experiences, the elite athletes declare themselves professional tennis players without first stepping foot on a college campus. The high rankings and earnings show that skipping college has paid off for them. All of this is not to say that all individual sport athletes should go pro and all team sport athletes will be broke because nothing is guaranteed. But considering the type of sport an athlete plays is definitely important. Beyond the actual sport that they play, athletes may also want to consider the market before they decide whether college is the right place for them to pursue sports. An excellent talent with no market to sell it, does not a profitable career make. It’s clear from players’ salaries, television time and endorsement/sponsorship options that not every sport sells the same as others. An athlete’s potential stake in the marketplace is another point of consideration for females who are making the decision to play professional sports as opposed to playing in sports in college. If an athlete plays a sport that doesn’t command much attention from the masses, it is highly unlikely that the athlete will be able to earn a comfortable living playing that sport alone. While athletes in individual sports tend to command higher earnings, in assessing the market, the athlete should recognize that her marketability depends on more than the sport she plays. Location, location, location. It’s important in real estate and in determining whether an athlete will be marketable. For example, in the United States, where players in the WNBA are not huge moneymakers, athletes should consider their marketability in other countries. If an athlete’s skill level is of an international caliber, she may consider forgoing college and pursuing her career overseas. In 2012, when the average WNBA salary was about $72,000, players were able to secure seven-month contracts ranging from $40,000 to $600,000. A select number of athletes were even able to make $1million. So, if an athlete is willing and able to expand her reach beyond the US market, she has the chance to significantly increase her earnings. There’s an old saying that timing is everything. The old adage is true in relationships and it’s true in business. A female athlete can have all the talent and skill in the world, but if people aren’t concerned with her sport, she won’t be able to make large amounts of money or gain publicity. Take gymnastics for example. Generally speaking, the American public focuses its attention on gymnastics once every four years during the Olympics. Should a young gymnast do well in the Olympics, it may be in her best financial interest to forgo the option of participating in the sport in college and collect on the potential endorsement deals and sponsorship available immediately before and after the Olympic games. She’ll only have the public’s attention for a limited time. Consider Gabby Douglas. At the age of 17, she became the first woman of color and the first African-American gymnast in Olympic history to win gold as the Individual All-Around Champion. She also became the first American gymnast to win gold in both the individual all-around and team competitions at the same Olympic games. With her dynamic Olympic debut, in poured the money and the fame. She could have decided to turn those opportunities down go to college; but I think that she realized that the nature of the sport and the fact that she shouldn’t guarantee repeat results or offers in the 2016 Olympics, meant that those opportunities may never come around again. So she cashed in. As I mentioned in Media Darlings, an athlete’s marketability also depends on factors like personality and physical appearance. To put it bluntly, the more attractive those things are to the masses (or the more attractive people can make those things to the masses), the greater the athlete’s potential market. And with that, we’re on to the last of the big three, and probably the most important one, talent. Without the talent, the market and the sport really don’t matter. It’s no secret that not everyone will have the skill to be a professional athlete. More importantly, not every really good athlete will have the talent to succeed as a professional athlete. Remember, less than 1% of student-athletes go on to play sports professionally. So when considering her options the athlete must be honest about her skill level and the odds. For an athlete with mediocre or just good capabilities (*points to self*), it’s probably wise for them to seriously consider taking the opportunity to play their sport in college, so that they have the ability to pursue a career other than sports should their athletic endeavors fall short of their aspirations. A free education and a great college experience is worth its weight in gold. For those with exceptional talent, the decision may become a little more difficult. Sure, this group may be really talented and may have a chance at the pros, but it’s not really a sure thing, so they can’t leave college in wind. There are some stellar athletic programs that can give athletes access to world-class facilities and coaching. For the athletes who may seem destined for a career in professional sports, but who have not yet had the chance to test her skills in international competition (for instance), college offers the opportunity to further develop and mature her skills, provide her with additional exposure, and prepare her for stiffer competition; all while getting her an education. This may be the ideal solution for some; great preparation and a sweet back-up plan. And then you have the third class of talent; the group for whom college might seem less appealing. These athletes have tested their talents in international competition and succeeded. They know that they have what it takes to win and make it as a professional athlete. They must weigh delaying the professional world or cashing in as soon as possible. Each option has its pros and cons, but as the talent level increases, and the chance at a successful career in sports increases, the athlete has a better basis for starting her professional career without first attending college. 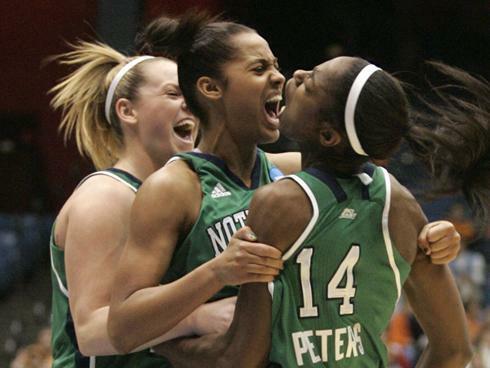 For the vast majority of female athletes, the utility of college sports is a no-brainer. Get a free education and graduate with a degree that will prepare them for lives as non-professional athletes while playing the sports they love. For them, sports are means to an end, a tool. Because the number of athletes who fall into this category is so great, I would conclude that college sports are in fact still worth it for female athletes. The symbiotic relationship between female athlete and school is still a very viable, necessary thing. Without college sports, many female athletes would end their athletic careers in high school and many would not have the opportunity to attend college. Without college sports, campuses would be devoid of a great bit of school spirit and diversity. Generally speaking, it really is a profitable situation for both parties. But the story does not end there. For the less than one percent of female athletes whose talent is global, college sports may be more of a hindrance than an aid. Not only do NCAA regulations prevent them from profiting off of their expirable talents, but college curriculums prevent them for participating in rigorous training and competition that will bring out the best in their abilities. Once these athletes consider their talent, their market and their sport, college seems more and more like an endeavor for the far off future. Of course the athletes should and probably do take into account other things like their families and how they prioritize education. But for the most part, as women’s sports grow, participating in college sports seems less and less worth it for these athletes. Turning down large sums of money for a degree that can be obtained at any time seems less and less appealing. And, in my opinion, that is a great thing. When more women have the option to skip college or leave early, that means we have truly taken the world by storm and carved out a legitimate marketplace for women’s sports. I’ll be happy for the day that commentators are asking how many years a school is going to get out of a basketball player before she enters the WNBA draft. Something tells me that that day is not so far off. 1. Salaries for soccer players abroad tend to be significantly higher than those in the NWSL because those teams are often backed by successful male clubs.